Mouse monoclonal SERCA2 ATPase antibody [2A7-A1]. Validated in WB, IP, IHC, ICC, Flow Cyt, ICC/IF and tested in Mouse, Rat, Sheep, Rabbit, Guinea pig, Dog, Human, Pig, Xenopus laevis. 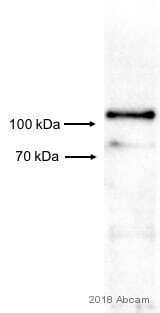 Full length native protein (purified) corresponding to Dog SERCA2 ATPase. Purified from canine cardiac sarcoplasmic reticulum vesicles. The epitope this antibody recognizes (amino acids 386-396) which is present in both isoforms (SERCA2a and SERCA2b). ICC/IF: U-251 MG, A549 and HeLa cells. IHC-P: Human left ventricle, skeletal muscle, tonsil and liver tissue. Flow Cyt: HepG2 cells. ATP dependent calcium pumps are responsible in part for the maintenance of low cytoplasmic free calcium concentrations. The ATP pumps that reside in intracellular organelles are comprised of a family of structurally related enzymes, termed the sarcoplasmic or endoplasmic reticulum calcium (SERCA) ATPases. The SERCA2 gene is subject to tissue dependent processing which is responsible for the generation of SERCA2a muscle-specific isoform expressed in type I (slow) skeletal, cardiac and smooth muscle and the SERCA2b isoform expressed in all cell types. The SERCA3 gene is not as well characterized and is found in non-muscle cells. Our Abpromise guarantee covers the use of ab2861 in the following tested applications. WB 1/1000. Detects a band of approximately 110 kDa (predicted molecular weight: 110 kDa). A lower background band at ~80 kDa may also be detected. Blocking conditions will need to be optimized. Immunofluorescent analysis of SERCA2 ATPase using SERCA2 ATPase Monoclonal antibody (2A7-A1) ab2861 shows staining in U-251 MG (Human brain glioma cell line) cells. SERCA2 ATPase staining (green) F-Actin staining with Phalloidin (red) and nuclei with DAPI (blue) is shown. Cells were grown on chamber slides and fixed with formaldehyde prior to staining. 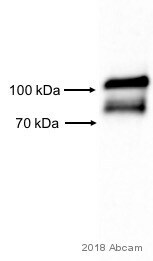 Cells were probed without (control) or with or an antibody recognizing SERCA2 ATPase ab2861 at a dilution of 1:100-1:200 over night at 4°C washed with PBS and incubated with a DyLight®-488 conjugated secondary antibody. Images were taken at 60X magnification. Immunocytochemistry/ Immunofluorescence - Anti-SERCA2 ATPase antibody [2A7-A1] (ab2861)Christoforou et al PLoS One. 2013 Jun 13;8(6):e65963. doi: 10.1371/journal.pone.0065963. Print 2013. Fig 5. Immunofluorescence characterization of cardiomyocytes differentiated from the cardiac progenitor cells. A–D. The cardiomyocytes formed well-defined cross-striated sarcomeric structures as determined by the expression and spatial organization of Actn2, Tnnt2, and Myh6 and also expressed the ventricular specific protein Myl2. E–F. The cells also formed robust intercellular electrical and mechanical connections as determined by the spatial organization of Cdh2 and Gja1. G. RFP(+) cardiomyocytes stained positive for sodium/potassium ATPase (Atp2a2) using ab2861. Immunohistochemistry was performed on both normal and cancer biopsies of deparaffinized human skeletal muscle tissues. To expose target proteins heat induced antigen retrieval was performed using 10mM sodium citrate (pH 6.0) buffer microwaved for 8-15 minutes. Following antigen retrieval tissues were blocked in 3% BSA-PBS for 30 minutes at room temperature. Tissues were then probed at a dilution of 1:200 with a mouse monoclonal antibody recognizing SERCA2 ATPase ab2861 or without primary antibody (negative control) overnight at 4°C in a humidified chamber. Tissues were washed extensively with PBST and endogenous peroxidase activity was quenched with a peroxidase suppressor. Detection was performed using a biotin-conjugated secondary antibody and SA-HRP followed by colorimetric detection using DAB. Tissues were counterstained with hematoxylin and prepped for mounting. Overlay histogram showing HepG2 (Human liver hepatocellular carcinoma cell line) cells stained with ab2861 (red line). The cells were fixed with 4% paraformaldehyde (10 min) and then permeabilized with 0.1% PBS-Tween for 20 min. The cells were then incubated in 1x PBS / 10% normal goat serum / 0.3M glycine to block non-specific protein-protein interactions followed by the antibody (ab2861, 1µg/1x106 cells) for 30 min at 22ºC. 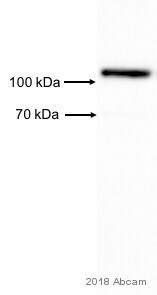 The secondary antibody used was DyLight® 488 goat anti-mouse IgG (H+L) ab96879 at 1/500 dilution for 30 min at 22ºC. Isotype control antibody (black line) was mouse IgG2a [ICIGG2A] (ab91361, 1µg/1x106 cells) used under the same conditions. Acquisition of >5,000 events was performed. Immunofluorescent analysis of SERCA2 ATPase using SERCA2 ATPase Monoclonal antibody (2A7-A1) ab2861 shows staining in HeLa (Human epithelial cell line from cervix adenocarcinoma) cells. SERCA2 ATPase staining (green) F-Actin staining with Phalloidin (red) and nuclei with DAPI (blue) is shown. Cells were grown on chamber slides and fixed with formaldehyde prior to staining. 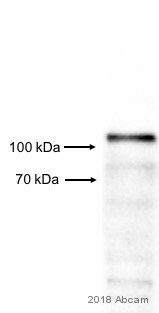 Cells were probed without (control) or with or an antibody recognizing SERCA2 ATPase ab2861 at a dilution of 1:100-1:200 over night at 4°C washed with PBS and incubated with a DyLight®488 conjugated secondary antibody. Images were taken at 60X magnification. Immunohistochemistry was performed on both normal and cancer biopsies of deparaffinized human liver tissue tissues. To expose target proteins heat induced antigen retrieval was performed using 10mM sodium citrate (pH 6.0) buffer microwaved for 8-15 minutes. Following antigen retrieval tissues were blocked in 3% BSA-PBS for 30 minutes at room temperature. Tissues were then probed at a dilution of 1:100 with a mouse monoclonal antibody recognizing SERCA2 ATPase ab2861 or without primary antibody (negative control) overnight at 4°C in a humidified chamber. Tissues were washed extensively with PBST and endogenous peroxidase activity was quenched with a peroxidase suppressor. Detection was performed using a biotin-conjugated secondary antibody and SA-HRP followed by colorimetric detection using DAB. Tissues were counterstained with hematoxylin and prepped for mounting. Immunofluorescent analysis of SERCA2 ATPase using SERCA2 ATPase Monoclonal antibody (2A7-A1) ab2861 shows staining in A549 (Human lung carcinoma cell line) cells. Immunohistochemistry was performed on both normal and cancer biopsies of deparaffinized human tonsil tissue tissues. ICC/IF image of ab2861 stained HeLa (Human epithelial cell line from cervix adenocarcinoma cells. The cells were fixed with 4% PFA (10 min) and then incubated in 1% BSA / 10% normal goat serum / 0.3M glycine in 0.1% PBS-Tween for 1h to permeabilize the cells and block non-specific protein-protein interactions. The cells were then incubated with the antibody (ab2861, 5µg/ml) overnight at +4°C. The secondary antibody (green) was Alexa Fluor® 488 goat anti-mouse IgG (H+L) used at a 1/1000 dilution for 1h. Alexa Fluor® 594 WGA was used to label plasma membranes (red) at a 1/200 dilution for 1h. DAPI was used to stain the cell nuclei (blue) at a concentration of 1.43µM. ab2861 (1 µg/ml) staining SERCA2 ATPase in human left ventricle using an automated system (DAKO Autostainer Plus). Using this protocol there is strong cytoplasmic staining of cardiomyocytes. Sections were rehydrated and antigen retrieved with the Dako 3 in 1 AR buffer EDTA pH 9.0 in a DAKO PT link. Slides were blocked in 3% H2O2/methanol for 10 mins. They were then blocked with Dako Protein block for 10 minutes (containing casein 0.25% in PBS) then incubated with primary antibody for 20 min and detected with Dako Envision Flex amplification kit for 30 minutes. Colorimetric detection was completed with Diaminobenzidine for 5 minutes. Slides were counterstained with hematoxylin and coverslipped under DePeX. Please note that, for manual staining, optimization of primary antibody concentration and incubation time is recommended. Signal amplification may be required. Publishing research using ab2861? Please let us know so that we can cite the reference in this datasheet.